Described as an artist with “electrifying intensity and lyrical expression” by Kyoto Newspaper and “mesmerizing interpreter” by Friends of Music Magazine, Japanese violinist Eiko Kano is known for her sensational and dynamic performances. Eiko has a thriving international career as a soloist as well as a chamber musician collaborating with distinguished artists such as principal oboist of the Berlin Philharmonic Albrecht Meyer, Eugene Drucker of the Emerson Quartet and Ani Kavafian while working closely with living composers premiering new works. As a child, she quickly emerged into major concert scenes in Japan since winning the 1st prize in the “All Japan Student Music Competition” at age 11. Eiko also earned the highest recognition both as a violinist and principal actress in TV drama series based on true story of Japanese legendary violinist, Hisako Tsuji. Her performance at the masterclass given by Isaac Stern was overwhelmingly acclaimed by him who immediately invited her back the following year. Eiko won 2nd prize and Kuroyanagi prize (scholarship for overseas study) in the nation’s most prestigious competition “Japan Music Competition” and also won 3rd prize in the 4th Tokyo Internationl Music Competition .Her sensational performances then led her receiving invitation by late Ruggiero Ricci to study with him both in Assisi Italy and Salzburg with full scholarship. Since then she has given recitals in most major cities in Japan as well as appearing as a soloist with Nagoya Philharmonic Orchestra, The Tokyo Metropolitan Symphony Orchestra, Kansai Philharmonic Orchestra, Teleman Chamber Orchestra and Vienna Mozart Chamber Orchestra. She has been awarded numerous prestigious scholarships including from Asahi Beer Art Foundation, the Rohm Music Foundation, and the Foval Foundation in which she had granted the use of the Stradivarius ”Rainville” violin previously owned by Norbert Brainin of the Amadeus Quartet. 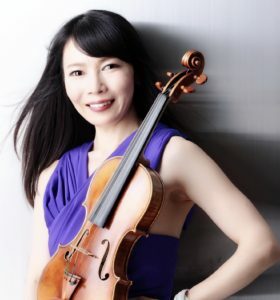 Eiko currently serves as an assistant concertmaster in Grammy-Award winning Albany Symphony Orchestra, regularly plays in the New York Philharmonic and also performed on tour with the Israel Philharmonic with maestro Zubin Mehta and Lorin Maazel. She is on the artistic advisory board and a concertmaster in the newly founded Pegasus: The Orchestra based in New York. Eiko received BM and MM from Manhattan School of Music and is a long-time resident of New York City. Her teachers include Glenn Dicterow, Yoko Takebe, Lisa Kim of the New York Philharmonic, Chieko Sogabe, Kazuki Sawa and Kenneth Cooper in chamber music. In 2016, she launched concert series titled “A Manhattan Story” (unique style of violin music with original storytelling). The first edition of the series “Winter” has been released on an album in summer 2017 and will be featured in the audio program on all international flights of JAL, Japanese Airlines in November and December, 2018. Eiko is the founder of chamber ensemble THE NEW YORKERS, featuring Karen Hakobyan as her duo partner. 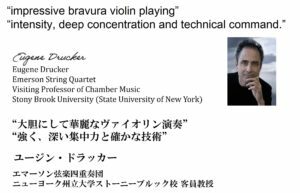 From November 2018, the Stradivarius 1725 Violin “Wilhelmj” will be loaned to Eiko by Nippon Music Foundation.